We are located in the beautiful Matanuska-Susitna Valley in SouthCentral Alaska. My name is Cheri Hagen and I am a long-time Alaskan living here over 38 years, all in the SouthCentral area. I currently live with my husband, Brian and three wonderful Rottweilers; Gabi, who is 10, Knight who is a half-brother to Gabi and is 7 and Tyme who is a daughter of Gabi. Tyme is 3. We live on 10 acres where we have lots of room for the dogs to run and play. 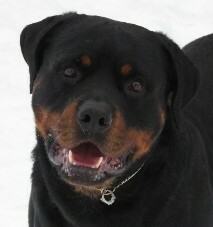 I am a COE Breeder belonging to the American Rottweiler Club, the Rottweiler Club of Alaska, and Cook Inlet Kennel Club. I am active in all three clubs serving as President of the RCA and Vice President of CIKC. I am also the Obedience Statistician for the American Rottweiler Club. In addition I am an AKC Breeder of Merit.